I've recently taken up baking again, and I've been making a lot of bread. Although I give most of it away, part of my experimentation is about seeing how long my different breads last and what I can do with it when it goes stale. 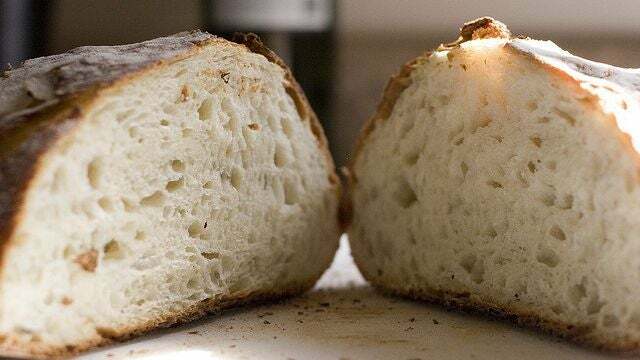 Whether you bake your own or buy your bread, you can get a lot of use out of it even after it goes stale (unless it's also gone moldy; don't eat that stuff). We've talked about the best way to store your favourite foods and we've offered up a few clever ways you can try reviving stale bread. But there are also some great ways to put that staleness to use. 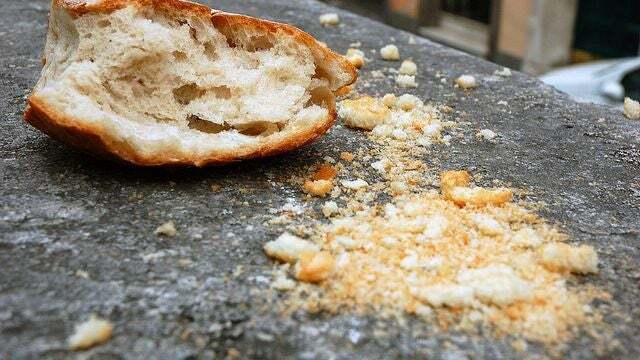 Just like homemade bread usually tastes better than store-bought, bread crumbs made from homemade bread taste better, too. And when you make your own, you get to control what, if anything, goes into them and how fine your crumbs end up. You'll need the bread to be really stale, essentially rock hard. If you need to, slice it up, put it on a sheet pan, and stick it in the oven at a low temperature (around 90C) until it's nice and dry. Let it cool a bit, toss it into a food processor, and pulse until it's the consistency you want. If you don't have a food processor, stick it in a zip bag and beat it with a hammer or the back of a frying pan. You can also add salt and dried herbs if you want. Stored in a sealed glass jar or stout zip bag, they should last for months. You can also stash them in the fridge or freezer and get even more time out of them. I love croutons in my salad, but the ones I buy in the store are usually too salty, too heavily spiced or just kind of boring. This is another time that stale bread comes in handy. 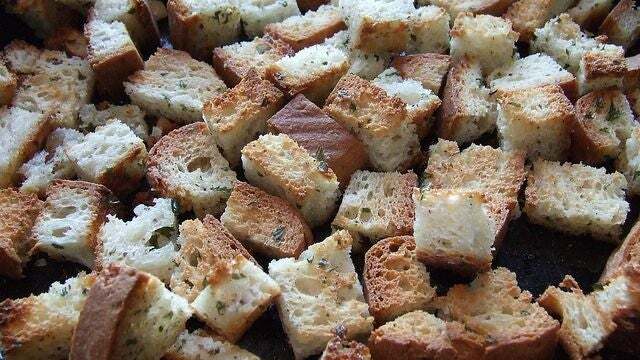 Croutons are easy to make. The trick is that you'll need to start with bread that's at least soft enough to slice up. If your bread is too hard, rinse it with cold water and stick it in a 120C oven for a few minutes. Cut the bread into cubes or whatever shapes you like. Dump them into a big bowl, drizzle on some olive oil or melted butter until the bread is well-covered, spice it how you like, and then spread croutons out on a sheet pan. Bake at 200C until they're nice and crisp, usually about 15 minutes. Olive oil, salt and red pepper flakes. Olive oil, salt, thyme and rosemary. Butter, salt and a couple of gloves of garlic, minced and sautéed. These are great for Caesar salads. Panzenella (an Italian bread salad). Stuffing for your next turkey. 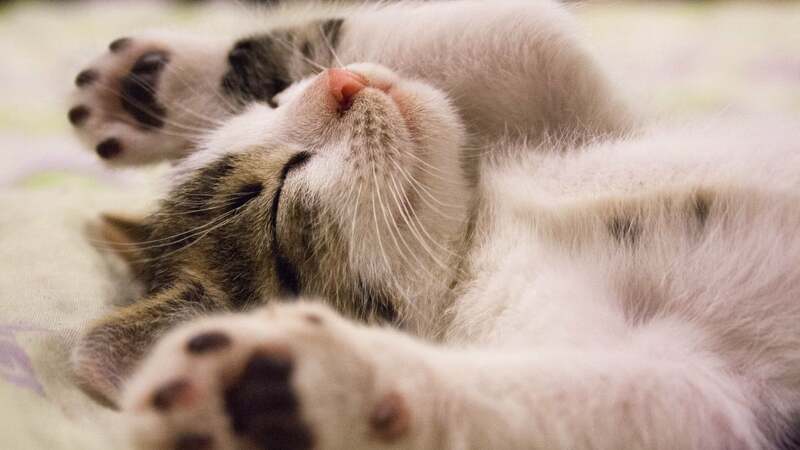 You can freshen a loaf by putting a few drops of water on top and put it in the oven for 5 to 15 minutes. If you have chooks, wet stale bread is like manna from heaven for them! Strangely I find bread goes mouldy before it goes stale, must have something to do with the climate in the parts of Australia I have lived in I suppose. mine goes mouldy, it is the moisture content when left in the bag + warm house, condensation. Left out of the bag for 10 minutes = stale and dries up.